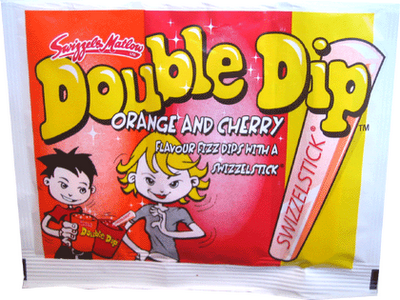 The UK is now in a double dip recession, which sounds kind of fun, but is actually a Very Bad Thing. We’re all feeling the pinch, so what’s to be done when it’s the week before payday, but you still want to eat out? The answer is pub grub, and Wetherspoons is surely one of the UK’s best known purveyors of budget nosh. 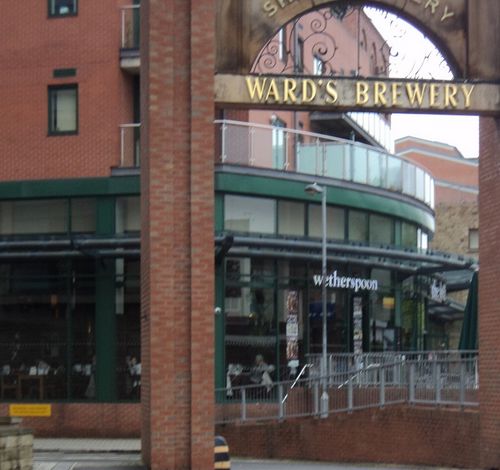 For our penny-pinching evening out, the Sheffield Eats team descended on Sheffield’s newest Wetherspoons, the Sheaf Island on Ecclesall Road. The menu at the Sheaf Island is pretty much a carbon copy of every other Wetherspoons out there, but it still reads like a list of all-time pub faves: scampi and chips, curry, bangers and mash, steak and kidney pudding, fish and chips. For the adventurous, there’s even nods to more modern cuisine: customers can choose from a very healthy-sounding superfood wholewheat pesto pasta, or a lentil, mushroom, mozzarella & pumpkin seed roast. Yum! We kicked off our food order with a five bean chilli (£4.60) which came with rice and tortilla chips. The chilli was a generous mix of butter, kidney, haricot, cannellini and pinto beans in a satisfying tomato sauce. The rich and spicy sauce in particular got an enthusiastic thumbs up from our reviewer. 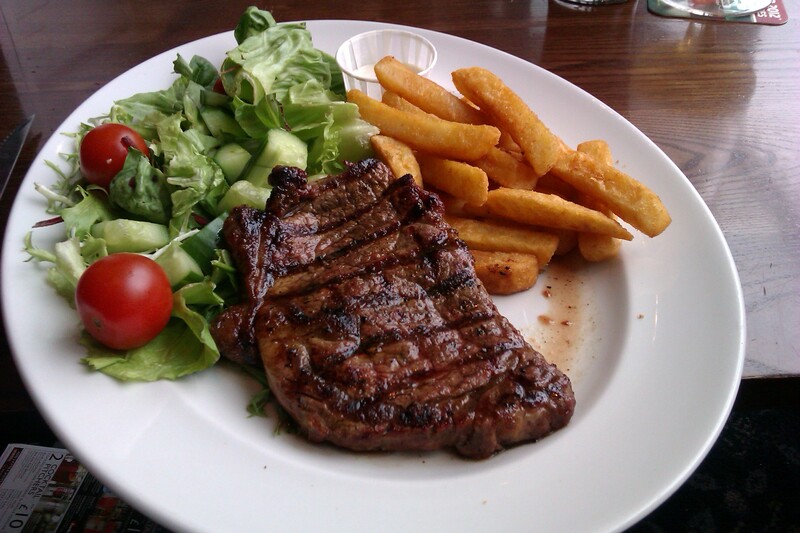 Also arriving at our table was a ‘Simple Steak’ (£7.20) a no-frills 8oz rump steak with chunky chips, and a drink included in the price. 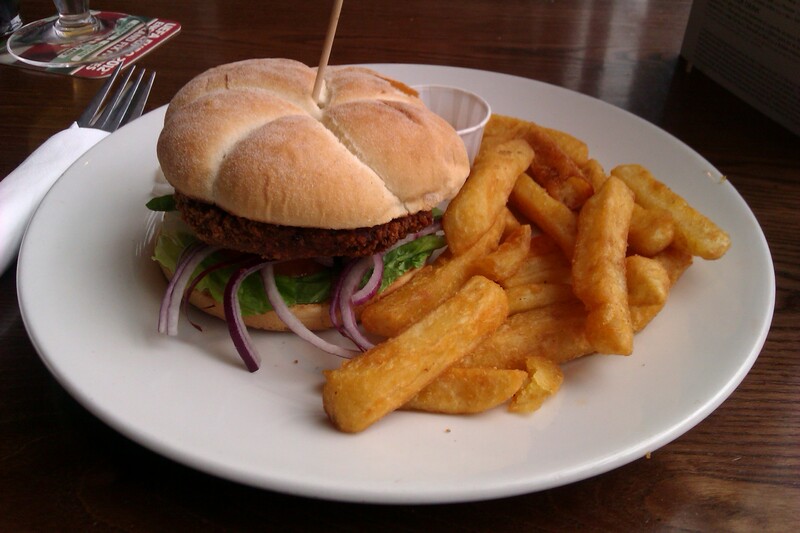 And the deals just kept on coming, as my veggie burger deal (£4.99) also came with a drink. However, when we began tucking into our steak and veggie burger, we hit a snag: the food was only lukewarm and, worse, it had that overbaked taste of food that’s been left under a hot plate for too long. The veggie burger was packed with sweet potato and lentils, and would have sat nicely in my stomach; a wodge of pure comfort good – if it had arrived at the table hot. By the time I got around to the chips, they’d gone completely cold. Even the stingy portion of salsa dip that came with the chips wasn’t enough to give them that fiery kick. The steak was juicy and came with plenty of chunky chips but again, it was a rush to finish the meal before it went cold. Between us, we’ve eaten in the Sheaf Island a few times, and have always been impressed by the speedy service (perfect for when you’re ravenous after a long day at work), cheapness, and quality of their pub grub. However, there’s no excuse for serving food that’s clearly been stood cooling for a while. On this occasion, the Sheaf Island’s budget eats left us feeling short changed.